A graph is a picture that shows how sets of data are related to each other. When we make a graph of a function, we are showing how its output changes as we vary its input. For example, on the right is the graph of the function The input values (x) of the function are plotted across the horizontal (x) axis. The corresponding point on the curve is the value of the function for that input. Recall that when you square a positive or negative number, the result is always positive. The graph shows this by going upwards (positive) on both sides of zero. The shape of the graph is a "fingerprint"
The shape of the graph gives us insights about the function, and each function has its own characteristic shape. 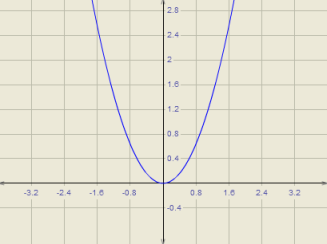 For example the shape of the graph above is called a parabola, and it is the shape associated with any function that has x raised to a power (here 2). So you can glance at a curve with that shape an immediately guess the function has its input raised to a power. See Graphical Function Explorer. On that page is an applet where you can enter any functions you like and see what they look like plotted as a graph. You can plot up to three functions on the same graph to see how they compare. The instructions are on that page.